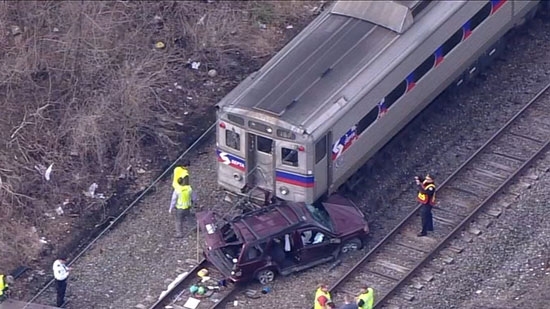 A SEPTA Regional Rail train on the Media/Elwyn line struck a car on the tracks in Lansdowne, Delaware County on Monday morning, 4/8. It happened around 9:05 a.m. at Union Ave. The inbound train #1342 collided with an SUV and pushed it about 500 feet down the tracks. The female driver of vehicle was taken to Presbyterian Hospital and is on life support with an "unsurvivable injury." There were no injuries to the 300 people on board the train. They were bussed the rest of the commute. A number of vehicles had gone through the train crossing despite the signals and lights being activated. A train heading outbound had passed shortly before train 1342 came through and the gates stayed down as the inbound train approached. Drivers started to go around the gates after the first train passed thinking they were stuck, not realizing another train was coming the other way. UPDATE: The woman injured in the car/train collision on Monday, 4/8, has died from her injuries. Police in Delaware are investigating after 6 people were shot and injured outside of a corner store on Sunday evening, 4/7. It happened around 7 p.m. at Bill's Meat Market on the corner of 10th and Pine Streets in Wilmington. The victims were taken to local hospitals and treated for non life-threatening injuries. Investigators are trying to determine what led up to the shooting. No arrests have been made. Two thieves that were caught on surveillance camera last week stealing a stone lion statue from the porch of a West Chester home were caught again on camera returning it. West Chester police posted the surveillance video of the theft on their facebook page last week. Just a few hours later, the resident's cameras recorded the two suspects returning the sculpture. They also left a bouquet of flowers and a card.